The Fourth of July weekend is often home to one of the biggest tentpoles of the summer, which staked its claim as much as two years ahead of the fact – and then as frequent as not, disappoints. We have just the film to fit that bill this year but fortunately also something that should surpass it. 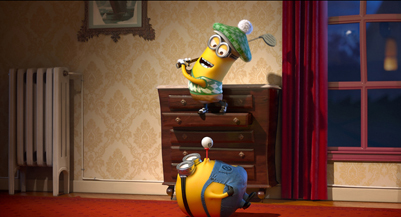 Despicable Me was the surprise animated hit of 2010, earning over $250 million on the backs of a winning and charming vocal performance from Steve Carrell, a sincere but not saccharine storyline that was also filled with a decent amount of action and slapstick absurdity, and of course, those minions. I'm convinced the little yellow gibberish spouters are responsible for about $100 million of that total, thanks to their inherent adorableness and childlike violence. It's one of the best decisions in an animated movie since Toy Story 2 decided to flesh out Woody's background. Despicable Me 2 brings back all these elements, but instead of having Carrell's Gru being a quasi-bad guy out to prove to the world he has what it takes to be a real villain, he's drafted by the anti-villain league to fight against a new enemy (voiced by Benjamin Bratt). In addition to all the mayhem and deft swipes at the bureaucratic agencies that would have to exist in these worlds, Despicable Me 2 manages to craft a story around how Gru will deal with his new fatherhood responsibilities while being a “good guy”. Relatively standard stuff, one admits, but also a highly relevant topic (in the broader sense) for its core audience, filled with kids who want their parents around more and parents guilted within an inch of their wallets. Opening in close to 4,000 venues, Despicable Me 2 should build handily on the original's $56 million, with the five-day opening period spreading things out quite a bit. Over three days we can expect around $72 million, with another $45 million or so prior to the weekend.